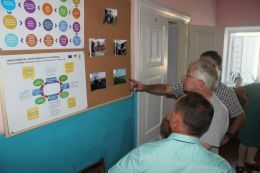 On August 29 UN Resident Coordinator and UNDP Resident Representative in Ukraine Neal Walker and International Project Manager of the joint EU/UNDP «Community Based Approach to Local Development” (CBA) Project visited partner communities in Odesa region. During business trip UNDP senior management visited Strumok village, Tatarbunarskiy rayon and Vinogradne village, Bolgradskiy rayon to monitor how local communities implement their initiatives with the CBA Project support. 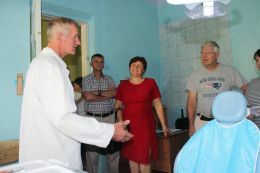 Villagers of Strumok demonstrated their newly reconstructed health post. Thanks to the joint efforts of the local authorities, community and the Project now people in a small remote village now have access to a better healthcare services. The total cost of the microproject was around USD 10 000, out of which community provided more than USD 500, local budgets provided more than USD 2 300, and the rest provided EU/UNDP CBA Project. The next stop was in village Vinogradne, where local community developed an agriculture service cooperative to raise their wellbeing. This initiative was supported by the CBA Project. Jointly villagers procured agricultural equipment and demonstrated first results of their economic activities. The total cost of the microproject was around USD 33 000, out of which community provided more than USD 8000 and the rest provided EU/UNDP CBA Project. 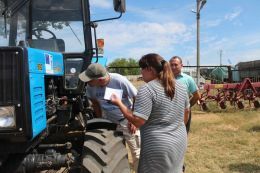 One more microproject aimed to support procurement of agricultural equipment to enhance capacities of the cooperative was recently approved for support.